A campaign against demolitions and eviction of renters is taking credit for the downfall of outgoing Burnaby Mayor Derek Corrigan. 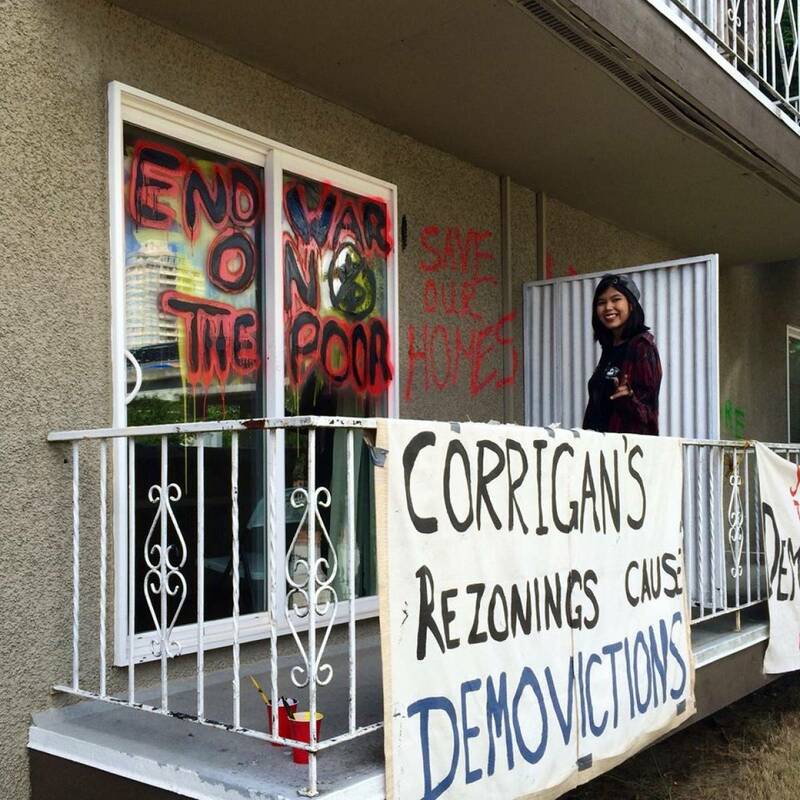 “We beat Corrigan!” the Stop Demovictions Burnaby declared in a media statement. The campaign is organized by the Alliance Against Displacement, which has been fighting for renters driven away by new condo developments in the city. The group popularized the term demoviction, which combines the words demolition and eviction. In the statement Wednesday (October 24), the campaign stated that it is celebrating the “successful dethroning of the demoviction king”. The epicentre of the Burnaby campaign is Metrotown, where hundreds of rental units had been torn down over the last number of years. Corrigan, who has been city mayor since 2002, was defeated in the October 20 election by Mike Hurley, a retired firefighter. During the campaign, Hurley promised to stop demovictions. “After 16 years of iron-fist rule, Derek Corrigan has been forced out of Burnaby City Hall by the community power of grassroots organizing against demovictions,” according to the campaign’s media statement. The statement recalled that the campaign took almost four years, with actions ranging from door-knocking to marches, building occupations, and releases of reports and analyses. The campaign also noted that voter turnout in Burnaby in the last election increased from less than 25 percent in 2014 to 33.4 percent in the October 20, 2018 election. “By building a movement that stimulates the political imagination needed to fight for a different system of land relations, Stop Demovictions is combating apathy,” according to the statement. The campaign also asserted that its movement open a path for Hurley’s victory. “The activism of organizers and residents created the political space for Hurley to position himself as an alternative to Corrigan's reign of mass evictions,” the statement declared. Moreover, “Hurley has simply piggy-backed on our work”, the campaign asserted. “By refusing to give up our fight in the streets, we created an electoral political vacuum that municipal candidates were forced to scramble to promise to fill with inoffensive reforms—all that is possible within a profit-driven economic system hinged upon stealing and commodifying Indigenous territories,” the release stated. ACORN (Association of Community Organizations for Reform Now) Canada has issued a separate statement on the defeat of Corrigan. “Mayor Corrigan paid a steep price for mass evicting tenants,” ACORN Canada stated. “That alone is a victory. Politicians continuously undervalue the political power of low-to-moderate income tenants. Corrigan going down is a stark warning to politicians not to trample on us anymore!"